The TK box is laid out for connecting to the leak test system PMD02. Moreover the PMD02 must be equipped with the option "Temperature compensation". Then the TK box gets the supply from the PMD02 and delivers an analogous measuring signal for the evaluation. The complete evaluation and compensation takes place in the PMD02. The TK box has two (optional three) thermocouples connections. 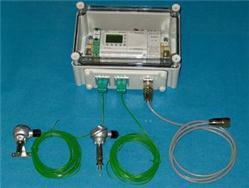 By means of this, e.g., the test part temperature and the ambient temperature can be grasped. 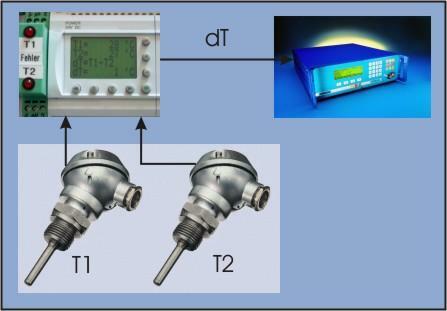 In the TK-Box can be defined how the input temperatures are processed to the analog output signal. With the option "test piece sensor change-over" a PMD02 with a suitable change-over can be operated in two test engine. Requirement for this is that these do not stand very far distant. The necessary thermo sensors (environment temperature sensor and test piece temperature sensor with springy sensor element) also belong to the TK kit. To the TK-KIT includes the necessary thermal sensors. A cable break, e.g., is signalled by a suitable error message. In addition PMD02 is generated in an error message.